My name is Linus Liljegren, im fifteen years old and from the little shy country Sweden. My plans are to be a 2d artist, and maby in the future work in the gaming industry or as a webdesigner. I have just bought a Wacom intous 3 A5 ( 6*8 for you guys ). I don´t know where to start? What should i learn first? anatomy? Shading? There are many questions in my head, where did you guys start? Is there any book i should read? dvd? The only 2 sketches i have are done on my wacom, i could send them to anyone with email. Just let me know! Well, first off you can post pictures here. Go to an imagehosting site like www.imageshack.us and upload your picture, then copy the link of the image and put it inbetween the [*img][/*img] tags, without the *'s ofcourse. Then we can see your images. With that out of the way, I suggest you study anatomy, (www.saveloomis.org is a good place to start). Read this tutorial! It will definately help you. Also there is a new forum at www.cgtalk.com It's theArtistic Anatomy and Figurative Art Forum. Go there and read Rebecca Kimmel's tutorial's and participate in them. Finally go look up MindCandyMan's sketchbook in the Sketchbook section of CA.org. I forget the name of it and the link, but you should be able to find it. It's probably the most inspiring sketchbook I've ever read. I can't wait until my Wacom gets here. Last edited by Mavrick71; July 17th, 2005 at 10:36 PM. I just have a few pieces of advice be dedicated dont stop drawing, learn your anatomy . Quite a few books are out there the loomis books are very helpfull, also once again keep doing your art things do not happen overnight it is hard at times but keep at it. If you upload your stuff you can post some stuff try photobucket I use it. Good luck hope to see you keep at it. I have heard about this Loomis guys...He was before my days tho. I´m gonna check all the links..
Oh i almost forgot my pictures... god im getting sleepy you all know the teenage drill. Well it's only 10:20 PM here, and yes I know the teenage drill, I'll be 15 in two months, then I get to drive . I'm guessing the first one was last in chronological order It looks pretty good, except for the skin tone. It would be good for a sunburned skin, but it's a little too saturated and make it a little more peachy/orange colored. To the second one, I can't it stress enough, study anatomy. The third one, I'm hoping this was your first eye, if it was the second you got worse, what happened, but I'm pretty sure it was first. Oh and about Loomis being before your time, I hope you're not discrediting him because of that. Da Vinci was before everyone today's time but you don't see anyone ignoring what he did, scientifically(well maybe a few things got disproved, but that's beside the point) or artistically. Well, were to start ... Umm start sketching daily! Everytime you get free time, draw. Go threw Tuts, and articals and look at others peoples works. Dont let anyone get you down, and its important not to ignor peoples crits either, Otherwise you wont learn anything. Your off to a good start, keep it up! ohh and POST, POST, POST! The first eye ( In chronological order ) was done in Alias sketchbook Pro. The only bad thing about that program is that you cant change the canvas size. It´s just a fast sketch program. Should i use photoshop? I'm new here ( signed up 2 weeks ago) but I've been making the rounds for a couple months. I'm somewhat older than most the folks here and been drawing and painting off and on for the last 10 years. The answering post that you have recieved so for have been excellent advise. ANATOMY, I can't stress it enough. Although I can get by it's a problem area for me and it's one thing that people will pick out about your work right off the bat. If your going to do drawings and painting of people make sure to get command of the human figure. Once you master that the rest will come a little easier. Good luck with everything and post your progress. jesus christ. first put away your wacom for a couple of months at least. buy a few anatomy books, and some pencils and draw. i don't want to be mean or anything but going digital straight away is only going to hinder your efforts. take it from me, i did that, it doesnt work. you gotta put the hard yards in. life drawing and anatomy are pretty much your basics. go and do. I think everybody learns diffirent. And i think i learn best by using my wacom, it´s a big diffirence between painting in real life and doing it digital on a wacom. Why would it hinder my efforts? a wacom is a difficult tool to use. you're right in that it is a big difference, and alot of people use wacom for the majority of their finished works, but NOBODY does ALL of their art on a wacom. Also, pretty much all of the finished work you see on these forums was done from pencil sketches initally. pencil is the basis of art, a wacom is an extension for use when you are already competant. using wacom to learn on is like trying to run when you havent learnt to walk yet. A wacom isnt gonna make you some super duper artist, if you cant draw, you cant do digital, its as simple as that. digital is too complicated a medium for a beginner. Once again, i don't want to burst your bubble, but if you really are serious about concept art, you have to learn the basics, and pencil is it. Last edited by waronmars; July 18th, 2005 at 11:08 AM. yea that about covers it hes right you know. Go and buy a sketchbook, take it around with you and draw when you get a chance. Its a kneaded eraser, or a puddy eraser. Its great because you can shape it into any form you want. Like, if you wanted to erase a little detail, you can form it do a very fine point. When I started drawing, I copied pictures. Its a good way to introduce you to basic drawing. Once you've become confortable with that, try drawing from real life. Set up still lives, or draw your friends, or draw anything at all. Keep in mind that drawing is fun, its not a chore. If you feel like taking a break from exercises, well, go ahead! You need to enjoy yourself more than anything. Last edited by AnarchyAo2; July 18th, 2005 at 12:59 PM. For those of us old enough to have experience on Quantel Paintboxes. They used Wacom tablets. And The Paintbox would easily replace a sketchbook for me. Photoshop is the worse interface. Quantel was designed by actually having artists involved, from ground up. Plus as I understand Quantels, which used to cost over $100,000 in the day, had chips dedicated to functions. Instead of using ram and software as a drawing program. The Quantel felt like a real drawing tool. A close second is Alias Sketchbook Pro, but it lacks a stencil tool (alpha). Once they add a stencil tool I believe, Sketchbook Pro and Wacom's Cintiq 21UX interactive pen display will be my sketchbook of choice. Until then, I agree you have to start with a real sketchbook, unless you can find an old Quantel out there on eBay. I´m doing the skull workshop thinge over at cgtalk.com you know Rebecca Kimmel's tutorial's. I have started to sketch the upper part of the skull, any tips? i advise you to pay attention to what these people tell you, they know the score. the skull is a definate improvement, but for now the appropriate place to put your work would be in a sketchbook or in the helpful critiques forum. Last edited by waronmars; July 19th, 2005 at 04:50 AM. Since you now know that waronmars has only one reply to everything (use a sketchbook...blargh), feel free to ignore him. I draw traditional ONLY when I intend to keep it traditional, but find myself more and more doing even my thumbs and roughs on my PC, WITH MY 9x12 WACOM, and then printing it out as a comp rough to put on canvas. A Computer, and a Wacom, and Software are TOOLS. 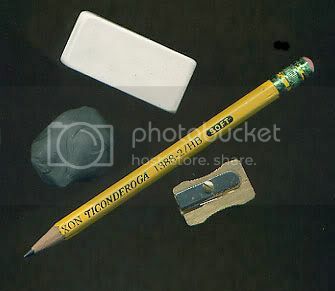 They are JUST as good as a Pencil and a "putty," not "puddy," kneaded eraser. In fact, depending upon your final usage of the creation, CG (Computer Generated) art is actually preferable in many instances. So go, draw with your wacom, and enjoy! You do NOT need to go back to the "Dark Ages" of pencil and paper. You simply need to learn to use your modern Tools in the most effective manner. PM me if you have specific questions. The whole topic can get extensive, because it IS more complicated than a pencil to paper. ya for real listen to these folks and start a sketchbook (if you havent already). And then I'd suggest working on your linework. Look at artists with good linework like Ed Lee or Feng Zhu and Phuzion and Wes (especially) and well any good artist and try to imitate a few of their styles in their lines and incorporate it into your own work. And study anatomy constantly. And just to add... draw a lot. Not saying be exactly like him but I read El Coro talking about he draws 16 hours out of the day sometimes. He is immortal of course but it's good to imitate folks like that. b. how many miles did you put into traditional media? don't you think these affect your use of tools? I would suggest adding even more "functions" to elwell's "program" - experiment with charcoals, acrylics, then maybe something less forgiving like water color. Traditional media, Hamsta, or specifically pencils? B.W. (Before Wacom) or A.W. (After Wacom)? After? So little it almost doesn't count. Digital tablets are almost NOTHING like pencils. *You don't look at your hand on the paper, you draw looking at the screen. *You can rest your hand ON your tablet, whereas if you try that with paper, you'll smudge and smear everything. *Don't like that last stroke you made? Ctrl+'z' makes it like it never happened...If you set your undos to the maximum (32 in Painter, I believe 25 in Photoshop), you can go back quite a few strokes without having to erase a thing. *Change your mind and decided you DO like it? You don't have to draw it again, just hit "RE-DO..."
*Don't like an entire section? Use the lasso tool to surround it, and hit "delete." *Want to try a couple different directions? Duplicate the entire image, and try whatever comes to mind. People don't spend all that money for the machine and the software to have someone tell them, "don't be using those, you don't know enough about drawing. You go use the pencil first for a few hundred hours, THEN, MAYBE we'll say you're good enough to use a Wacom..." PUHLEEZE! It's not the medium, it is the eye and the technique, nothing more. If you know about form, shape, value, depth, and line, you can make a drawing out of anything. Ever seen the Internet video of the guy doing art on an overhead projector with nothing but some sand? How about the guy who does giant 10 foot wide by 10 foot tall portraits of famous people simply by flinging paint at the canvas? Sure, for a very long time, pencil and paper were it if you wanted to learn how to draw. BUT, we are moving to a paperless society. There is NOTHING wrong with learning to use the new technology and to hone your skills on the computer. Especially since the skills required are NOT going to be learned with a pencil, chalk, or any other medium besides a digital tablet. I'm not saying avoid traditional media like the plague, I'm saying that you do NOT have to learn the "Old Fashioned Way" simply because that's the way it's always been done before. And, those who so presumtuously tell people to put away their Wacom are missing the entire point of training the eye and developing the technique with their mistaken assumptions that a pencil will make you learn better or faster than a tablet. This lame advice is particularly galling when it cannot offer any more constructive suggestions beyond "abandon your PC." No specifics like "Your values are too indistinct," or "Your lines are not even enough," etc. Lord knows there's been such an influx of truly crappy doodle art lately, that some members shouldn't even be allowed the rusty nail, but to tell someone to change media instead of improving their technique is ineffectual, as NOBODY in their right mind is gonna go, "Ooops, no wacom drawing or photo references for me...just good old pencil and paper, and drawing from life, yessir!" as well as semi-technophobic. Madster, just as you, WARONMARS has her own right on expressing her oppinion on this forum equal to yours. You are not the only one privalidged to advice people what or what not to do. So just treat her and other with a little bit respect. Swedish viking stated he is a new person to not only this forum, but to all that involves art. I think, starting on waycom right away, is not wise to do, but is a choice. You choose to learn programs, you learn how to work colors. Not precisely how to draw. I think, by learning the basics on paper, by learning the whole technics behind what you look at on the computer, understanding how curtain affects on the computer are made, will eventually make you more creative and more advanced in making the art. Ofcourse you can learn how to draw-on-a-computer. But when you don't know the things behind it, you'll find yourself stuck on one level sooner or later. I'd say combine origional drawing with digital painting. You'll see if you increase your drawing skills your work digitally will increase in skill too. Next to that, this tread is started for questions how or wheres. This is not the place to post all your work or get critics on them. If you want your work to be criticized, make a sketchbook in the therefor standing forum. Not all your work has to be criticized, so you dont have to post all of them. Its morely a checkup for yourself on how you can advance, what others see that you have overlooked. Don't expect everybody that gives critiques to prize you to seventh heaven, its not where critiques are for. Don't take it personal, mostly the more critiques, the better the work, if its crap, nobody will either bother to critique or doesnt know where to start. Take it as a compliment and embrase it! IF you have any other questions on how this forum works, please visit the faq or our irc channel. I have one reply because it's a good reply. People at this level NEED to do alot of drawing if they hope to improve. Ask any pro the same thing. actualy no one will get to a very high artistic level without learning the basics. and the basics are best learned with tradition media. Why you ask? because having to do 500 drawing of the same still life to get it perfect and hiting ctrl z 50 times till it looks ok is VERY DIFFERNT. learning tools traditionally is easier too. programs change from program to program. oil paint will always be oil paint. and theres a certain degree of being personally involved with traditional media you dont get from digital. you cant just use your thumb or fingers to get "into" your painting. again traditional is the way to go while learning. its funny who you say flinging paint at a 10 foot canvas compared to paper is more "tech". THATS TRADITIONAL! also show me any school or teacher who has student learn anything on a tablet or witht he digital medium. sorry but i can help you there. no one. digital is just not good for beginers because not only are you learnign to draw you have to learn a program. and even if you learn that program if you go into another no matter what your skills you have to learn that program for the beginning. Last edited by |NTeRN; July 20th, 2005 at 04:40 AM. I think your ambition is admirable, but nobody becomes a rockstar without learning an instrument. nobody becomes a professional stunt motorcyclist without learning to ride a bike. i'm sure you've got all the tools, now use them. don't let your toolshed collect dust, and don't think that buying more tools will mean you'll use them more. if anything, you'll probably feel lazy for stocking up on supplies that just collect dust and glare at you angrily from their holders. what i mean is, just because you have a ferrari in your garage doesn't mean you know how to handle it. if you've never taken driver's ed and don't know how to shift gears or accelerate smoothly, you're gonna crash and burn. get comfortable with being able to use any medium to get desired results, then you can use whatever medium you want to. Digital just helps speed the process of production. if you don't know how to do it with a pencil, it'll be very difficult to find its mirror in the digital realm. A5 tablet vs. A4 (or even A3) Paper.